Suitable for decorating Erin Condren, Plum Planner, InkPress, Day Designer, Bullet Planner, BuJo, Webster Pages, Happy Planner, Kikki K, Filofax, and many other planners. Stickers are made to order. Please allow up to 2 business days for us to prepare your order for shipping. Water resistant matte finish permanent stickers. Sticker sheets are approximately 7.5" x 5"
INFRINGEMENT FREE! All Blue Moon Stickers art is created in-house by artist Mary Layton, or officially licensed from the original creator. Art work copyright © Mary Layton. All rights reserved. 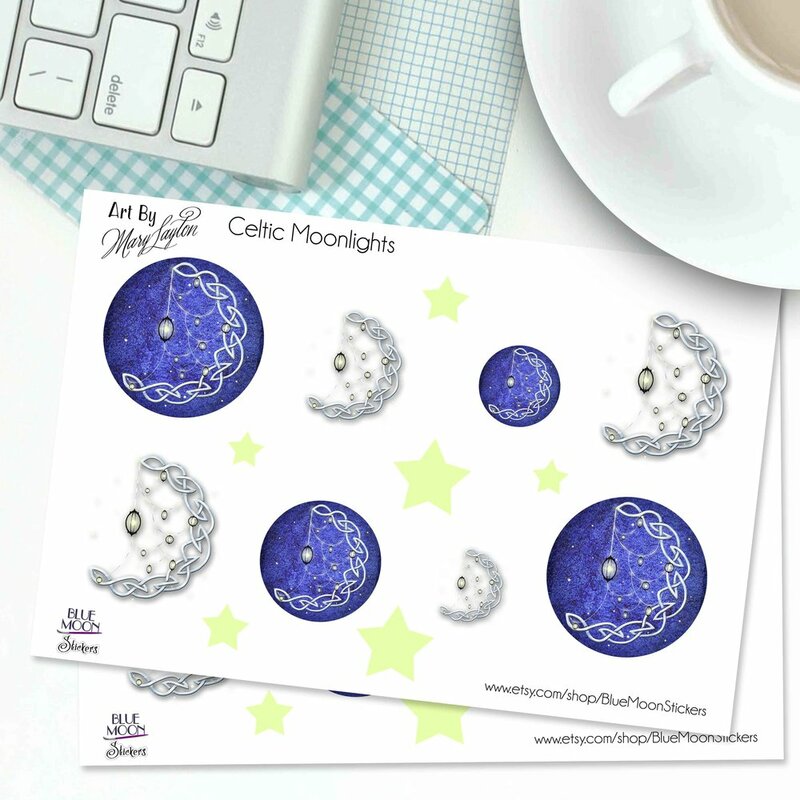 Celtic knot moon and stars stickers by mythic artist Mary Layton to prettify your stuff. Sticker sizes vary from approximately .5" to 2". Inspirational floral and butterfly stickers by mythic artist Mary Layton to prettify your stuff. Sticker sizes vary from approximately 1" to 2". Inspirational floral stickers by mythic artist Mary Layton to prettify your stuff. 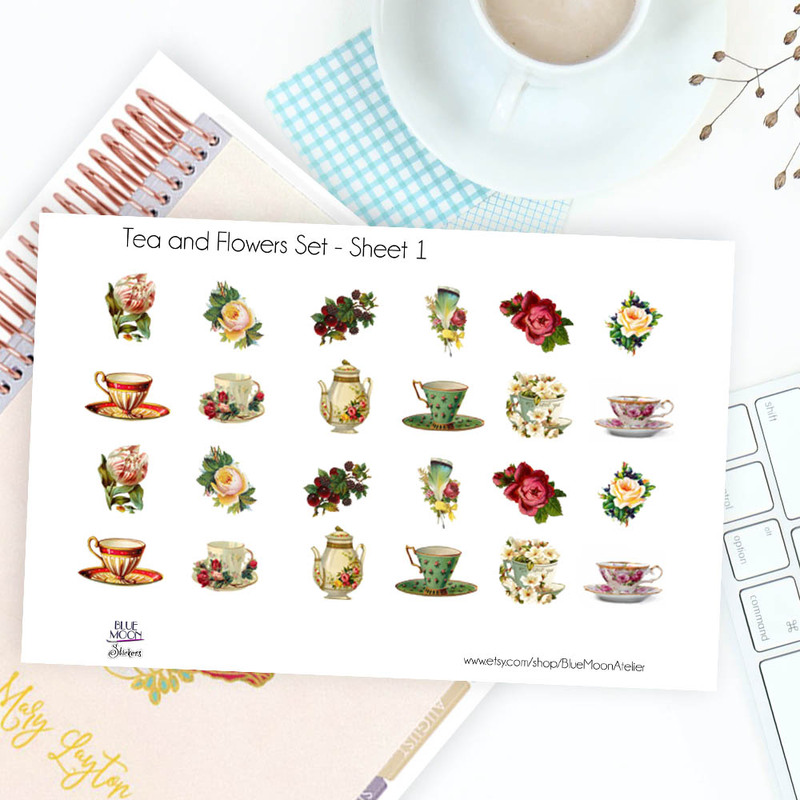 A selection of tea and floral imagery to prettify your stuff. Sticker sizes vary from approximately 1" to as small as .5". Available individually for $3.99 per sheet, or purchase the complete set (44 stickers!) for $6.99 and save $1.00! A selection of lovely butterflies by mythic artist Mary Layton to prettify your stuff. Sticker sizes vary from approximately 1.5" to 2". A selection of lovely faeries by mythic artist Mary Layton to prettify your stuff. Label Size: 1" x 2.625"
Mailing Labels also make great Gift Tags! Label Size: 2" x 4"